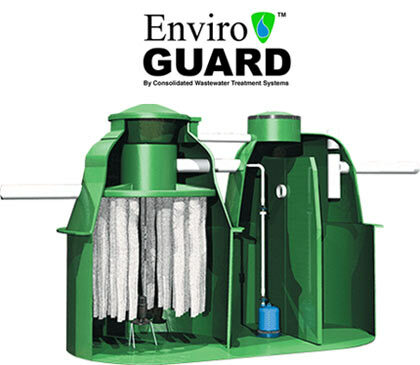 Enviro-Guard is the ultimate in wastewater treatment: a self-contained, scalable designed system that removes, organic material, solids, pathogens, and nitrogen. Enviro-Guard is the only choice for sensitive environments. Enviro-Guard starts with a 540-gallon primary treatment tank to capture and retain large solids and inert materials followed by a 570-gallon dose tank, which utilizes true time-dose and flow equalization controlled by our pump package system designed to pre-mix, aerate, and control the volume of water for scheduled dosing into the Multi-Flo treatment engine. This makes the Enviro-Guard system scalable from 0-750 gallons per day by simply adjusting the dose frequency, interval, and volume rate. The final tank is the aerobic treatment tank, which contains a quiet, water-cooled, energy efficient submersible aerator, and 132 square feet of 100 micron fixed film media in which the wastewater must filter through before it can be discharged. The Enviro-Guard is designed to condition, dose, and treat wastewater such that the effluent can be recycled to the native environment. Enviro-Guard systems remove organic materials solids by over 98 percent. Effluent concentrations of organic material and solids are routinely less than 5 mg/L. In addition, Enviro-Guard reduces total nitrogen, mostly nitrate, by over 60 percent. Were that not enough, NSF conducted a test to determine how long an Enviro-Guard system would take to return to proper functioning after two-months of non-use. The result: two days! Enviro-Guard is the only solution for sensitive environments, restricted sites, and seasonal or intermittent uses. Because the Enviro-Guard utilizes an “aerobic” treatment process, there are no offensive “rotten eggs” odors commonly associated with septic tanks. The specially designed, totally submerged aerator is almost 100% noise-free. This eliminates the annoying noise created by top-mounted aerators and auxiliary compressors, which must be located in or near the home. Built upon the Multi-Flo technology, the Enviro-Guard provides pre-treatment, flow equalization, and advanced treatment in a single, lightweight design. Best of all, the system is scalable (from 0-750GPD) and ideal for intermittent use applications. Although periodic, routine maintenance is necessary to insure continuous, trouble-free operation, all service is provided by local factory-trained representatives. The Enviro-Guard alarm system alerts the homeowner of any pending problems. The self-contained design reduces installation time and the fiberglass construction eliminates the need for expensive cranes or boom trucks to set the unit making it perfect for tight lot applications. The low profile lids allow immediate accessibility to all serviceable components. All necessary inspections and maintenance can be done quickly and easily without digging up the yard. Tamperproof fasteners prevent unauthorized entry into the unit. Consolidated Treatment Systems warrants each Enviro-Guard treatment plant to be free of defects and workmanship for a period of two years from the date of installation. Each Enviro-Guard comes complete with tank, audible/visual alarm, aerator, and dose pump. The highly treated, filtered effluent produced by the Enviro-Guard is over 98% free of the normal sewage contaminants that cause the “progressive failure” of conventional systems. The Enviro-Guard has been certified under ANSI/NSF Standard 40 protocol as a class 1 system. Enviro-Guard systems remove organic materials solids by over 98 percent. Effluent concentrations of organic material and solids are routinely less than 5 mg/L. In addition, Enviro-Guard reduces total nitrogen, mostly nitrate, by over 60 percent. Were that not enough, NSF conducted a test to determine how long an Enviro-Guard system would take to return to proper functioning after two-months of non-use. The result: two days! The Enviro-Guard is perfect for small lot applications. In addition, depending on local and state regulations, it may be permissible to reduce normal drain field sizing requirements or to discharge the effluent (with disinfection) directly to an approved receiving stream. CHECK WITH YOUR STATE, COUNTY, OR LOCAL REGULATORY OFFICIAL TO DETERMINE IF SUCH REDUCTIONS ARE PERMITTED.